Access Time - The time it takes a computer to retrieve stored data. Technically speaking, access time is the time interval between the instant a computer calls for data from a storage medium (such as a hard disk, CD-ROM, or the Internet) and the instant the data is delivered. Active Directory - Active Directory is the LDAP directory service that replaced NT's LanManager service with the release of Windows 2000 Server. This change was made because of A.D.'s better scalability and organization. A directory service is essentially a database of network resources (known as objects) and information about each of these objects, much like a phone book. Earlier network operating systems such as Banyan Vines and Netware utilized a directory service. AGP - Short for Accelerated Graphics Port, an interface specification developed by Intel Corporation. AGP is based on PCI, but is designed especially for the throughput demands of 3-D graphics. 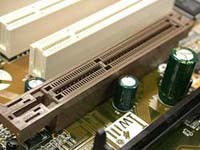 Rather than using the PCI bus for graphics data, AGP introduces a dedicated point-to-point channel so that the graphics controller can directly access main memory. The AGP channel is 32 bits wide and runs at 66 MHz. It can achieve throughput up to 266Mbps. Answer File - An answer file contains the operating system settings that you want to configure automatically during an unattended installation of Windows operating systems. Apache - Apache is an open-source HTTP Web server and is one of the most popular web servers on the Net. Originally developed for Unix operating systems, it is most commonly used with Linux and it can now be run on Windows as well. It is a full-featured server with many powerful add-ons freely available. Apache's major competitor is Microsoft's IIS. The name comes from its origins as "a patchy" web server. ARP (Address Resolution Protocol) - A host PC must have the MAC and IP addresses of a remote host in order to send data to that remote host, and it's ARP that allows the local host to request the remost host to send the local host its MAC address through an ARP Request. ASCII - Stands for "American Standard Code for Information Interchange". ASCII refers to the coding system that assigns numerical values to characters such as letter, numbers, punctuation, and other symbols. Basic ASCII allows only 7 bits per character (for a total of 128 characters). The first 32 characters are "unprintable" (line feed, form feed, etc.). Extended ASCII uses 8 bits and adds an additional 128 characters that vary between computers, programs and fonts. ASCII was developed in 1968 to standardize data transmission among disparate hardware and software systems and is built into all personal computers. ASP1 (Active Server Pages) - An Active Server Page is a dynamic web page that includes program code that is processed on a Microsoft IIS web server before the page is sent to the user. The code (usually written in vbscript or jscript) is typically used to access data from a database and that data is then built into the returned web page "on the fly". ASP was developed by Microsoft and is a feature of Microsoft's web server software, but the dynamically generated pages can be viewed by almost any browser. ASP2 (Application Service Provider) - An application service provider is a company that offers individuals or enterprises access over the Internet to application programs and related services that would otherwise have to be located in their own personal or enterprise computers. Asynchronous - Not synchronized. Communication without any timing mechanism. Instead of a timing mechanism you have communication rules. There is a start bit and a stop bit to notify the other end when communication starts and stops. 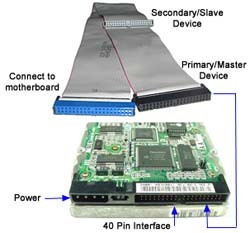 ATA (Advanced Technology Attachment) - More frequently referred to as IDE, ATA is a connection type used in some current and most older machines to attach hard disks and optical drives to the motherboard. Variations are ATA33, ATA66, ATA100, and ATA133 with each number representing the maximum number of megabytes the host can transfer per second. Uses an older 40-pin IDE (Integrated Drive Electronics) cable for connection. To confuse matters, with the advent of Serial ATA (SATA), ATA is now referred to as Parallel ATA (PATA). ATM (Asynchronous Transfer Mode) - ATM is a high-speed, packet-switching technique that uses short fixed length packets called cells which are about 53 bits in length. ATM can transmit voice, video, and data over a variable-speed LAN and WAN connections at speeds ranging from 1.544Mbps to as high as 622Mbps. Attenuation - The degradation of a signal traveling on a cable as it travels farther from its originating point. Repeaters are network devices used to boost the signal in order to allow the signal to travel farther. ATX - Currently, the ATX form factor is the most widely used for new PCs. Introduced by Intel in 1995, ATX motherboards and cases make better use of space and resources than did the previous AT form factor. There are sub-categories of ATX that includ MicroATX and FlexATX. AUI (Attachment Unit Interface) - This 15-pin D connector is now obselete, but was used to connect devices to 10Base-5 (Thicknet) transceivers. Specifically, the AUI connector plugged into the transceiver that was attached to the thicknet backbone. 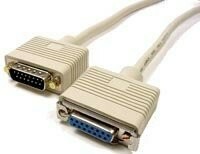 It was sometimes also referred to as a DIX interface, named after DEC, Intel, and Xerox who helped create the standard. AVI (Audio Visual Interleave) - AVI is a digital file format for audio and video that was created by Microsoft in 1992. This type of video is composed of JPEG images laced together in a very quick slide show. AVIs tend to have large file sizes and when compressed, they tend to lose quality. AVIs can be played with Windows Media Player.